Opponents said the proposed change reflects a misunderstanding of the benefits of slab foundations, would make it difficult to provide housing for an aging population in Oconee County, and is a taking of property rights. No one other than county staff spoke in favor of the proposed change. In the end, the Planning Commission voted to table the proposal until its next meeting on April 16. A full-page, color advertisement on the back of the first section of the March 22 edition of The Oconee Enterprise continues the protest and urges people to show up again at that April 16 meeting to oppose the change. The proposal before the Planning Commission would allow slab foundations only for “industrialized housing and manufactured homes” and in “age-restricted active adult dwellings (55 and older)” or in Continuing Care Retirement Communities. It does not specify what can be done with two-family dwellings. The new code would include the requirement of a compaction certification from an engineer in the cases where a slab foundation is allowed and specifications on how crawl spaces are to be waterproofed, drained and sealed. Sandy Weinel, assistant director of the Planning and Code Enforcement Department, introduced the proposed changes to the Planning Commission at the meeting on Monday. “This is not something new,” Weinel said. “This amendment is just to codify” conditions routinely set by the Board of Commissioners, she added. “They have been consistently placing this as a condition of zoning on single-family detached requests,” Kirouac said. Weinel and Kirouac said the document before the Planning Commission was being reviewed to make sure it was consistent with Americans with Disabilities Act regulations and would be modified once the legal review was complete. The turnout at the Planning Commission meeting was well orchestrated, with many of those present, including relatively young construction workers, wearing red T-shirts stating their opposition to the proposed change. Nine individuals spoke against the proposed new ordinance, including the current President of the Athens Area Home Builders Association Stephanie Doerr and Past-President Jared York. Doerr owns Make Mine Home interior design studio in Oconee County and is a contractor, and York is owner of J.W. York Homes of Athens. Many of those who spoke argued that the changing demographics with an aging population make at-grade slab homes an essential part of the market. Keith Anderson, director of construction at the Georgia Club, which straddles the Oconee County and Barrow County line, said within the industry, slab construction has taken over because of the aging population, which wants at-grade slab homes. None of those who addressed the Planning Commission spoke in favor of the raised slabs allowed in the current ordinance. The value of at-grade slab homes versus homes built on other types of foundations also was a theme of that ran through many of the comments at the March 19 Planning Commission meeting. “There is no difference in value between a slab and a crawl space,” said Matthew Snelling, owner of Warner Brothers Appraisal in Athens-Clarke County, who said he was speaking for Ryan Homes, a national homebuilder. Beall said he said he was representing a number of builders and developers, but he did not identify those parties. York said that the stipulation in the proposed ordinance that crawl spaces have to be waterproofed is misguided because there is no standard for such waterproofing and it cannot be done. He also said that current construction is producing tighter, more energy efficient homes, and that these home are bringing bad air out of the crawl spaces into the homes and creating humidity problems and mold problems in those homes. “If I had to choose for my family between a slab or a crawl space foundation, I would choose a slab foundation every time,” York said. “This is the wrong time in our history in how we build houses to encourage crawl-space foundations over slabs,” York said. Several of the speakers focused on the ordinance itself, which the county staff acknowledged had gone through several changes in the days running up to the Planning Commission meeting. “What is before you tonight is ill prepared,” said Arnold S. “Beau” Kaye, who practices law in Watkinsville and said he was representing builders, including Southfork Homes of Statham. “If this is voted through, this is a taking away of freedom of (county residents) to build the foundation of their choice,” York said. Commission member Chuck Hunt said he disagreed with Yarbrough and proposed that the requested change be tabled until the Americans with Disabilities Act component of the ordinance was specified. Commission member John Laster seconded the motion, but Yarbrough said “We’re not ready for a motion yet” and refused to allow a vote on the motion. The Planning Commission only makes recommendations to the Board of Commissioners, which ultimately will have to decide on the proposed changes. In the end, the Planning Commission voted 7-2 in favor of Hunt’s motion to table. It also contains a full video of the Planning Commission meeting, which is available on Vimeo. A person with a professional-grade camera sat in the front of the room of the Board of Commissioners Chamber during the Planning Commission meeting and made a recording of the meeting. The web page contains many of the arguments in favor of slab construction versus crawl-space foundations raised in the Planning Commission meeting and directs readers to the March 22 edition of the Enterprise. The paper has a lengthy story on the Planning Commission meeting in that edition on its Business page, B5. Neither the web page nor the advertisement in the paper provides any contact information or indicates who is financing the campaign. I attended the Planning Commission meeting, but Sarah Bell made the video recording below. The Planning Commission also approved a change in the language in the Unified Development Code dealing with landscaping. That discussion begins at 19:35 in the video. The discussion of the proposed change in the Unified Development Code regarding foundations begins at 34:06 in the video. 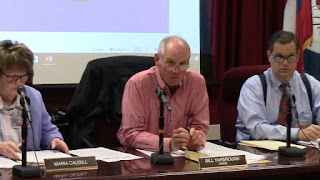 OCO: Planning Commission 3 19 18 from Lee Becker on Vimeo. To clarify for anyone speculating, no one on the editorial staff of The Oconee Enterprise has knowledge of who paid for the full-page advertisement. The advertising and editorial departments work independently of each other. Ken Beall of Beall and Company represented Burger King at the DRC meeting. Beall also had represented Stonebridge Partners LLC in the rezone request for two drive through restaurants opposite the school complex that includes Oconee Middle School, Oconee Primary School, and Oconee Elementary School. The revised site development plans reviewed by the DRC modify the previous plans to accommodate Burger King by adjusting the building location and revising the lot design. The site plans show a 3,410-square-foot-building separated by a parking from the existing Subway restaurant. The Board of Commissioners voted in July to rezone the nearly two acres for the two restaurants, both with drive-through operations. HA!, LetsGoOconee complains about anonymous ads while posting anonymously on a blog. Also I believe the site beside Burger King is going to be a credit union. I don't think anybody wants Gwinnett County and we won't ever be. We don't have the population base to make that happen. The biggest problem is that it's not going to stop a large builder, it might inconvenience them, but adding $10,000 - $15,000 to the cost of a house isn't going to stop them. It's going to stop the older crowd that owns land outside of subdivisions and wants to build a more accessible, efficient house. I don't care for the Atlanta(out of town) builders. They don't hire local subs, lawyers, or real estate agents, don't add enough to the tax base to cover the infrastructure that they use and leave when their profit is made. But I do value property owners rights. The county needs to come up with a better plan than taking away accessibility for everyone. Athens Area Homebuilders Association has been asking members to speak out against it. I personally read an email that they sent out to members encouraging them to show up, speak up and wear the red to the meeting. The reason they want slabs is that it’s the cheapest foundation to build. They could care less what happens to the county no matter what they say. Anyone who says that oconee can never turn into Gwinnett must of not have been here long. The county’s population has almost quadrupled in my lifetime and I’m nowhere near retirement age. I have watched rampant development ruin this county. I agree with the posted comments of 6:51PM. Not only is development ruining Oconee County it has been running Oconee County. Our schools will be greatly impacted by rapid development. We cannot provide the services (Parks, Libraries, Sheriff’s Dept., Fire Dep., Roads & Water Resources) without a tremendous increase in taxes. The BOC has to take a handle on the issue. I'm with LetsGoOconee. Fight GCS (Gwinnett County Syndrome)! We don't want cheap housing in Oconee County. Code already provides for slab construction for people over 55. For developers this whole thing is strictly about money for them and they don't give a darn about us becoming the next Gwinnett County. Oconee Countians don't back down! Next thing you know, they will be dictating your trim and fixtures. Need to reign in this Planning Commission. In the paragraph labeled "Value An Issue," on "expert" opines that is there no difference and another says there is. The money behind the protest is clearly acting in its own interest, which is understandable and logical. Just spare us the high-and-mighty and lofty principles other than the money. I am a foundation contractor, and 75% of the foundation's I install are crawl spaces. This being said, this new code would greatly benefit my company....but hey government, we need less of you, not more. ..let homeowners decide! Hmm, I missed this Commission meeting but after reading this and seeing a video which to linked I got all necessary things. I wanna thank you for this post. You give me all things.